In a test environment, VMware ESXi was needed. ESXi 4 supports 64 bit, and ESXi 3.5 supports 32 bit. Based on the hardware configuration, ESXi 3.5 was selected. However, we were interested in knowing how ESXi compares to ESX in terms of restrictions or “cripple” functions. After searching through the Internet and VMware to determine how ESX 3.5 and ESXi 3.5 differ in terms of functionality after applying the ESXi free license, I couldn’t find a definitive answer. So, I took a few screenshots to display what changed after applying the free license. 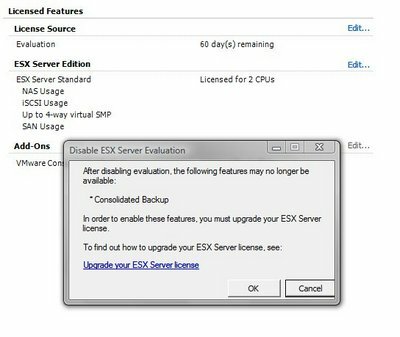 After applying the license, a pop-up message, Disable ESX Server Evaluation, displays that Consolidated Backup will no longer be available. Once the license is fully applied, the serial number replaces the number of days remaining and the add-on, VMware Consolidated Backup is removed. With this Add-On removed and if the need exists to backup the VMs, there is a community maintained script, ghettoVCBg2. I haven’t tested yet, but seems that it would do the trick.